Around 4.8 million people worked for small businesses at the end of June 2017—up 66,000 or 1.4 per cent compared with the previous year. Since 2013 the number of small business employees has increased by 197,000 or 4.3 per cent. The small business share of total employment in selected industries has fallen from 46 per cent at the end of June 2009 to 44 per cent at the end of June 2017. This is primarily due to stronger growth in the number of employees working for large and medium–sized enterprises in this period compared with small firms (growth of 578,000 for larger enterprises and 283,000 for medium–sized businesses compared with growth of 212,000 for small businesses). While the small business sector accounted for close to 44 per cent of total employment in selected private sector industries, it accounted for 35 per cent of total Industry Valued Added (IVA) for the same industries combined, 34 per cent of sales and service income and only 28 per cent of total wages and salaries. What do these results tell us about the contribution of the small business sector to the Australian economy? other small businesses (businesses that employ between 5 and 19 employees). The ABS defines a medium sized business as employing between 20 and 199 employees while large businesses employ 200 or more employees. In the context of accessing small business entity concessions, the Australian Taxation Office (ATO) defines a small business as a firm that has annual revenue turnover (excluding GST) of less than $10 million. If businesses are completing a tax return for 2015–16 or an earlier income year, their previous year's turnover must be less than $2 million to be assessed as a small business. Employment estimates by firm size are published by the ABS annually as part of the Australian Industry publication. The employment estimates are derived using a combination of data collected directly from the annual Economic Activity Survey (EAS) conducted by the ABS, and Business Activity Statement (BAS) data provided by businesses to the Australian Taxation Office (ATO). classified to the industry subdivisions of Public administration, Defence and Private households employing staff and undifferentiated goods–producing and service–producing activities of households for their own use. ABS data shows there were 4,770,000 people working for small businesses at the end of June 2017—up 66,000 or 1.4 per cent compared with the previous year. Since 2013, the number of small business employees has increased by 197,000 or 4.3 per cent. The small business share of private sector employment in selected industries fell from 46 per cent at the end of June 2009 to 44 per cent at the end of June 2017. During the same period the share accounted for by large sized firms increased from 30 per cent to 32 per cent. Medium sized businesses accounted for just under a quarter (24 per cent) of all employed persons at the end of June 2017—the same share they had at the end of June 2009. Between 2009 and 2012 the small business share of total private sector employment in selected industries fell by three percentage points to 43 per cent and has remained around this share since. 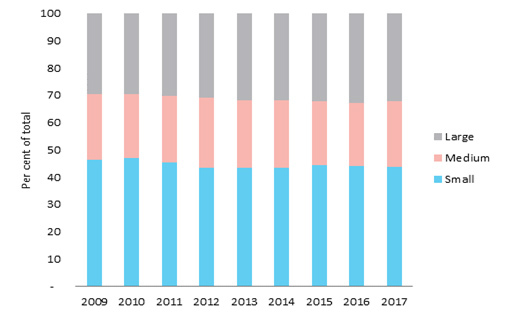 In contrast, the large business share increased by around three percentage points to 33 per cent by 2016 but has since fallen slightly to 32 per cent in 2017. Table 1 below shows that, while the small business sector accounted for close to 44 per cent of total employment in selected private sector industries, it accounted for 35 per cent of total Industry Valued Added (IVA) of those industries, and only 28 per cent of the total wages and salaries paid by firms in those industries. Table 1 shows the small business share of IVA is similar to their share of total employment in industries such as Agriculture, forestry and fishing; Mining; Rental, hiring and real estate services; and private sector components of Public administration. The small business share of total IVA is much lower than their employment share in Manufacturing; Construction; and Information, media and telecommunications, but much higher in private sector components within Health care and social assistance. Table 2 shows IVA per worker in small firms in Agriculture, forestry and fishing is higher than IVA per worker in medium and large sized firms in the same industry. But for most industries IVA per worker is much higher in large firms than it is for medium and smaller firms—particularly in Manufacturing, Construction, Wholesale trade, and Information media and telecommunications. The results showing IVA per worker for small businesses in Australia is lower than IVA per worker for medium and larger firms in a number of key industries is consistent with international studies. These studies show larger firms are more likely to produce greater output per worker than smaller firms as a result of deriving the benefits from economies of scale in terms of lower output costs from increased production. ABS data shows employees of small businesses are paid less than employees of medium and large size firms given their smaller share of total wages and salaries (28 per cent) compared with their employment share (44 per cent). This finding would appear to confirm employees of smaller firms receive wages and salaries that are commensurate with their relatively low labour productivity. Differences in wages paid by small and large firms could be influenced by a number of factors including the skill composition of the workforce and the prevalence of casual part-time employees. International research shows larger firms in the private sector tend to have a more highly skilled workforce who tend to be paid more on average than workers in smaller firms as a reward for their skills. Larger firms are also more likely to have a union presence that may assist in negotiating higher wage outcomes. Data from the Household Income and Labour Dynamics in Australia (HILDA) survey shows smaller firms are more likely than larger firms to use casual workers. Australian research found casual part‑time workers experience an earnings penalty of around six per cent for men and eight per cent for women compared with their permanent employee counterparts. More recent analysis by the Organisation of Economic Co-operation and Development (OECD) showed non–permanent workers in Australia experienced a wage penalty of between two and three per cent compared with permanent workers. 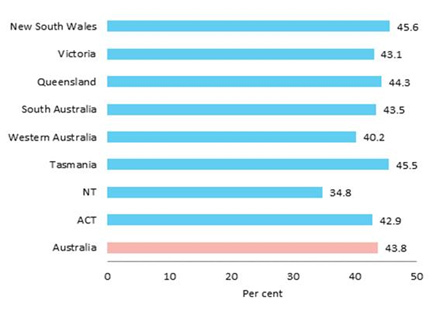 Figure 4 shows the small business share of total employment in each state and territory. New South Wales and Tasmania had the largest small business shares of total employment of selected private sector industries (45.6 per cent and 45.5 per cent respectively) at the end of June 2017 while the Northern Territory had the smallest small business share (34.8 per cent). Employment in the small business sector in the NT fell by 4,000 in the 12 months to the end of June 2017 whereas employment in larger firms grew by 7,000. This contributed to a decline in the small business share of total employment in the territory from 39.8 per cent in 2016 to 34.8 per cent in 2017. The slowing of the economy in WA is evident from the fall of small business employment by 28,000 (or 5.5 per cent) in the 12 months to June 2017 along with a fall in employment among large firms of 23,000 (or 5.3 per cent). Employment in medium sized firms in WA remained relatively stable. The United States has also experienced a declining small business share of total employment. Analysis of US Bureau of Labor Statistics data shows the share of total private sector employment accounted for by firms employing fewer than 20 workers in the US fell from 20 per cent in 1993 to 17 per cent in 2017 while the share working for very large firms (employing 1,000 workers or more) has increased from 36 per cent to 40 per cent over the same period. While not directly comparable, this data shows the small business share of total private sector employment in the US is much smaller than the small business share of selected industries employment in Australia. The Economist reported that ‘big firms are generally more productive, offer higher wages and pay more taxes than small ones’ while ‘economies dominated by small firms are often sluggish’. The article also noted that ‘big firms can reap economies of scale’ and ‘size allows specialisation, which fosters innovation’. But the author cautions that large firms ‘can be slow to respond to customers' needs, changing tastes or disruptive technology’. OECD data analysis shows labour productivity for large and medium sized firms (for all OECD countries that provided firm size data) is greater than labour productivity achieved by smaller firms in both manufacturing and business services industries. To the extent that large firms can exploit increasing returns to scale, productivity tends to increase with firm size. However, new small firms are often found to spur aggregate productivity growth as they enter with new technologies and stimulate productivity enhancing changes by incumbents. 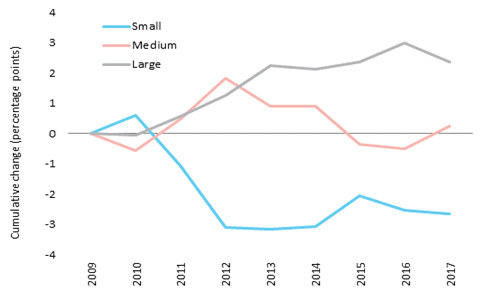 Larger firms are on average more productive than smaller ones, particularly in the manufacturing sector, partly reflecting increasing returns to scale, for instance, through capital intensive production. But smaller firms can outperform larger firms, particularly in the services sector, reflecting competitive advantages in niche, high brand or high intellectual property content activities as well as the intensive use of affordable ICT. In most countries, labour productivity gaps between micro and, to a lesser extent small and medium–sized firms, and large firms are relatively high, in particular, in the manufacturing sector. However, differences in productivity across size classes are smaller in the business services sector. The small business sector accounts for a significant share of total employment in Australia but that share has fallen slightly over the past eight years. 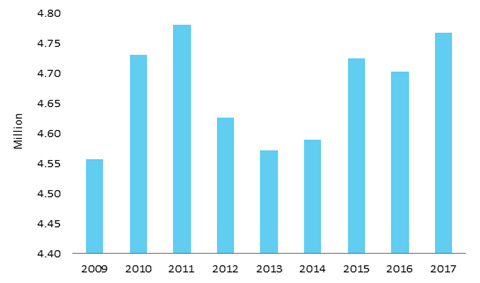 This trend is consistent with trends observed overseas. Research conducted by the OECD shows evidence of lower wages and labour productivity in smaller firms compared with larger firms in a number of industrialised OECD countries. However, little research has been conducted in this space in Australia.
. The ABS survey data used to determine these estimates excludes parts of the Finance and insurance industry, Government owned organisations in a number of industries, Public administration and Defence.
. ATO, Work out if you are a small business for the income year.
. ASIC, Are you a large or small proprietary company?
. IVA is an estimate of the difference between the market value of the output of an industry and the purchases of materials and expenses incurred in the production of that output. Sales and service income includes sales of goods, income from services and income from rent, leasing and hiring. Wages and salaries are gross (before tax) earnings of all employees in businesses.
. The Economist, Small is not beautiful: Companies and productivity, 3 March 2012.
. Haugen, F.J., Firm-size wage premiums around the world: Evidence from PIACC, June 2016.
. Parliamentary Library, Characteristics and use of casual employees in Australia, January 2018.
. Watson, I., Contented Workers in Inferior Jobs? Re-assessing Casual Employment in Australia, Journal of Industrial Relations, Vol. 47, No. 4, December 2005, pp. 371–392.
. OECD, In it together: Why Less Inequality Benefits All, 2015.
. The Economist, Small is not beautiful: Companies and productivity, 3 March, 2012.
. OECD, Compendium of Productivity Indicators 2017, p. 67.
. OECD, op. cit., p. 66. OECD, op. cit., p. 66.